Home / geekspeak / Microsoft sets Office free on the iPad. What’s the catch? 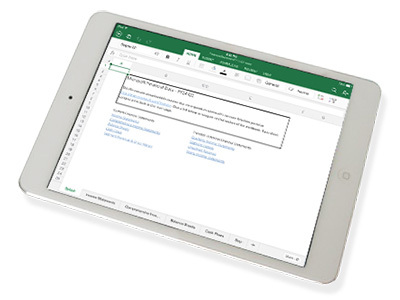 Microsoft sets Office free on the iPad. What’s the catch? It’s taken a number of years, and plenty of hype suggesting it was happening, but Microsoft has finally released a version of its highly popular Office applications for iPad. Before you start checking to see if you’ve fallen into an alternate universe where perhaps Microsoft doesn’t actually like money any more, there are some rather specific limitations to “free” in this case. Rather like all those iOS games that are “free” but require in-app purchases for you to progress, Microsoft Word, Excel and Powerpoint, the only apps currently available for iPad, are free to download and use for reading Word, Excel and Powerpoint documents. They’re very slick applications, too. Microsoft must have spent a reasonable amount of time and money producing each application, as they’re as close to the desktop versions in terms of usability as you could hope for. As long as you’re up to date on the latest versions of Office, the only shocks you’re in for are that they’re running on an iPad at all. So what’s the catch? They’re free as long as you’re simply looking at documents already created in each of the Office applications, but if you want to do any editing or creating, you’re going to need an Office 365 subscription. These currently run upwards from $89/year, covering one laptop and one mobile device. That puts the Office for iPad apps in an interesting space. There’s no doubt that Office is the current business standard, and in that context, it’s a smart play from Microsoft. It’s still obviously keen for people to buy Surface tablets and remain wholly within the Microsoft ecosystem, but it can’t ignore the fact that Apple’s been outselling it in the tablet space by a very large factor indeed. If you’re a business already paying for an Office 365 subscription with enough seats to cover the iPad as well, it’s pretty much just icing on the cake. This all fits within new Microsoft CEO Satya Nadella’s stated aims for Microsoft, which involve shifting it towards a services company with subscription pricing. Office is, and has been for a long while the real revenue engine that drives the company, so shifting here first makes a lot of sense. There are some limitations to the Office apps for iPad, the most notable of which is that you can’t currently print from any of the apps themselves. To do that, you’d need to upload them to Microsoft’s cloud-based OneDrive and print them from a regular PC. To be fair, that’s as much a limitation of the way iOS works as anything Microsoft’s consciously chosen to implement. What if you’re coming to Office without an existing 365 subscription, however? There it’s a bit more of a mixed offering depending on what it is you actually need to do. The office apps are naturally enough the best at showing their particular file formats with fidelity, but if all you need are basic word processing, spreadsheet or presentation applications, then Google or Apple’s free Docs and iWork apps are still highly capable applications in their own rights. They’re both free, and that’s free with no subscription sting in the tail, either. Equally, if you’re a little savvy with your document shifting, there’s very little stopping you using the free versions of the apps as readers, or in Powerpoint’s case as a full presentation machine by uploading them to OneDrive and accessing them on the go, saving your actual usage of Office for when you’re back in front of a full PC. While that’s not exactly Microsoft’s ideal usage scenario, it still ensures that you’re using Office and not another competing suite, which means that it’s still making money from you.